Healthy snacks can and should be both filling and satisfying. This particular snack is relatively low in calories, high in nutrients and each bite is a flavor and texture symphony. We are often taught to fear fat instead of understanding it. Fat is an essential nutrient. One of the benefits of including fat in a meal or snack is that it helps to keep us fuller longer. This is especially true when it is eaten with fiber, protein and complex carbohydrates. Avocados are considered a high fat fruit and also contain many other disease fighting nutrients such as phytochemicals, fiber, plant sterols and both of the essential fatty acids. People that include avocados in their diet on a regular basis are more likely to have smaller waist circumferences and lower risk factors for disease despite being a high fat food. This is in part because fats that come from plants are accompanied by beneficial nutrients and help to satisfy hunger longer which actually prevents continued snacking and calorie intake. Over consuming calories of any kind is when weight gain and disease onset begin to be observed. If we stay within our calorie range and the majority of the fat we consume is plant based, disease prevention and weight lose will be significantly more likely. We often hear that the best bread option is 100% whole wheat because it includes the bran. The bran is the outer layer of the grain that contains the fiber. This recommendation is promoted in the attempt to increase people's intake of this essential nutrient. I find this to be a very blind recommendation. In order to make a palatable loaf of bread with 100% of the bran the whole wheat flour must be treated with dough conditioners and extra gluten must be added. Because of the processing many of the nutrients that are considered essential are destroyed and are added back in their synthetic form. However, many phytochemicals that have multiple mechanisms of action in disease prevention are not replaced. Conventional bread also contains many preservatives to increase the shelf life. This can be seen on the very long ingredient list. Bread is traditionally made with four ingredients that include flour, water, salt and yeast. If one eats a whole foods plant based diet they will consume plenty of fiber and will not be dependent on highly processed bread to meet their recommended intake. Buying bread that contains only four ingredients means you will most likely buy from a local baker in your area. Because of the shorter shelf life, store the loaves in your freezer to preserve. My favorite is Stone House Bread's sour dough but any local baker will have superior bread to commercially produced loafs. Hummus is customarily made with chickpeas and sesame seed paste called tahini. Some unconventional hummus has recently hit the market and offer many new flavors that make an excellent spread. Eat well embrace life is my brand of choice and for this snack in particular I use their Carrot Sriracha hummus. 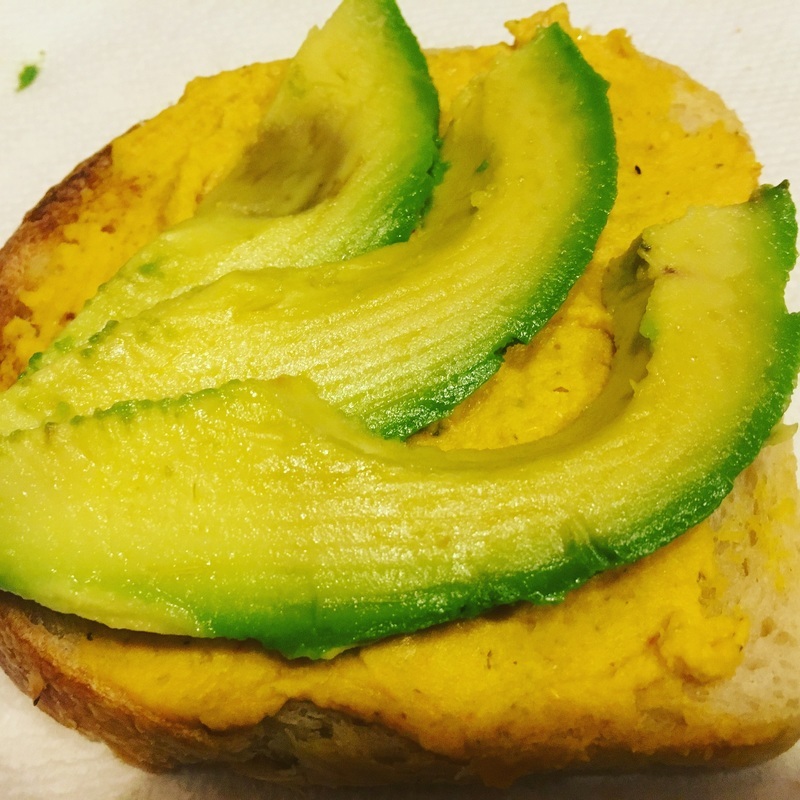 The spiciness from the hummus and the creamy sweetness from the avocado on top of the warm toasted sour dough makes this snack as flavorful as it is nutritious. Directions: Toast the bread in the toaster. Cut the avocado in half and then slice the 1/4 of the flesh. After the bread is toasted evenly spread the hummus and scoop out the avocado slices. Place the slices on the hummus.